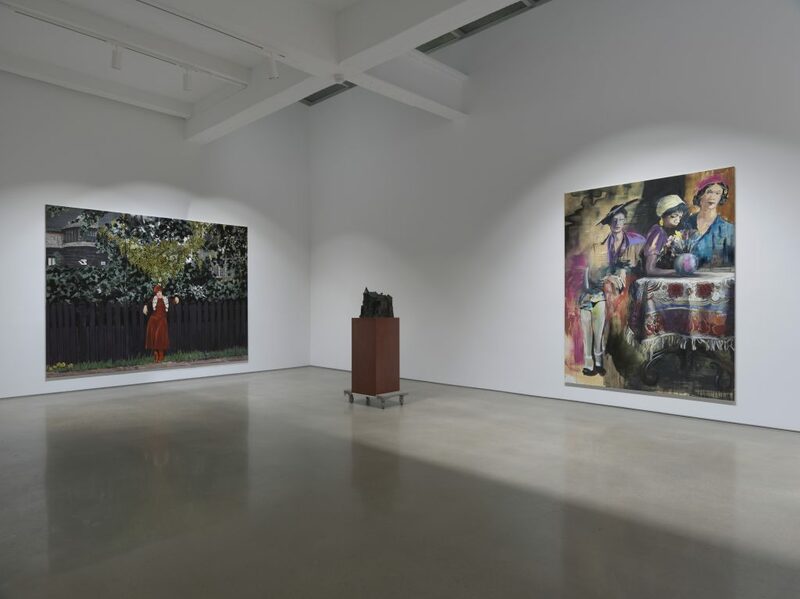 Paulina Olowska’s exhibition “Wisteria, Mysteria, Hysteria” at Metro Pictures focuses on recent paintings and ceramics by the artist. 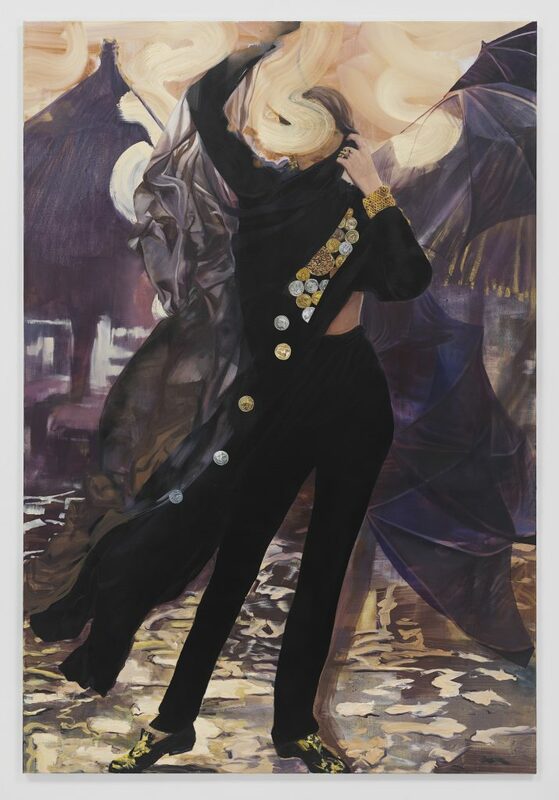 Since Olowska’s last show at the gallery in 2010, she has had major one-person exhibitions at Kunsthalle Basel; the Stedelijk Museum, Amsterdam; and the Zachęta National Gallery of Art, Warsaw. 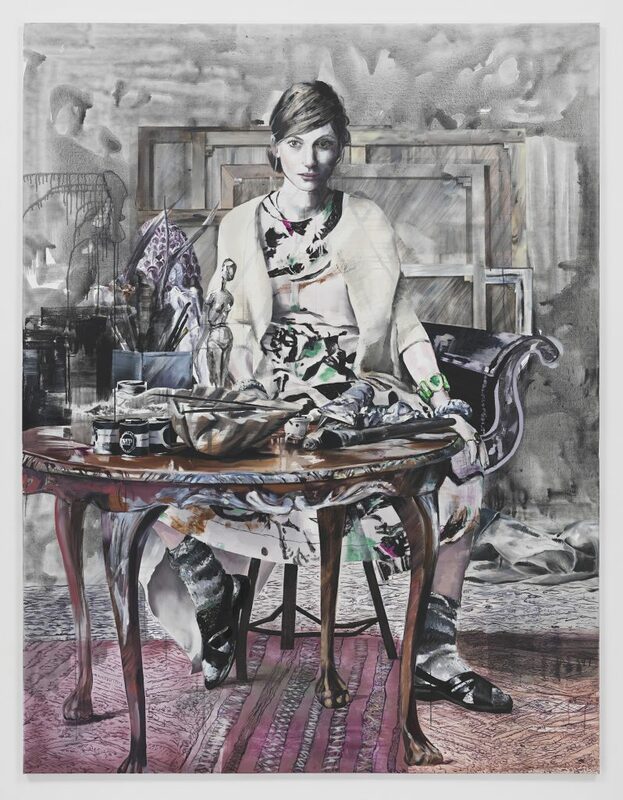 Olowska received the prestigious Aachen Art Prize in 2014, with an associated exhibition at the Ludwig Forum for International Art, Aachen, Germany. In the last six years, she has also staged performances at Tate Modern, the Carnegie International and the Museum of Modern Art. In January 2017 Olowska will present “Slavic Goddesses,” a newly conceived ballet at The Kitchen. 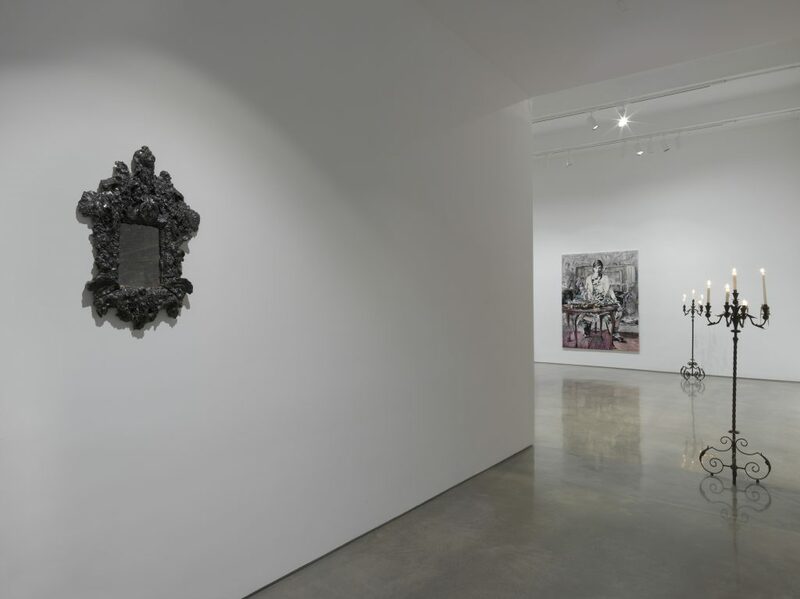 Throughout her more than 15-year career, Paulina Olowska has worked across performance, sculpture, painting, neon and fashion to reappraise history and bring recognition to underappreciated artists. Her wide-ranging artworks result from her dedicated exploration of the historical avant-garde, traditional crafts and experimental theater. 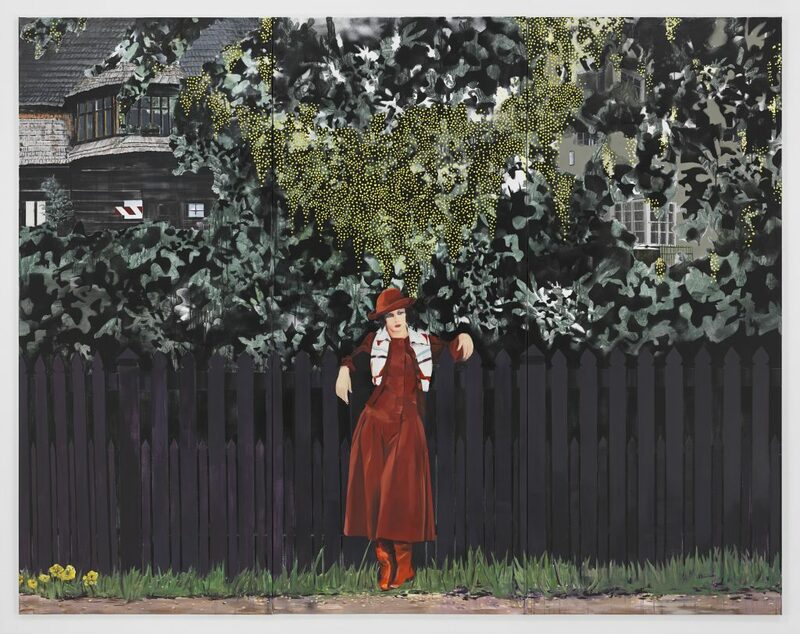 In “Wisteria, Mysteria, Hysteria,” Olowska presents her first series of paintings entirely conceived and executed in the small Polish village of Rabka-Zdrój, where she lives and works. 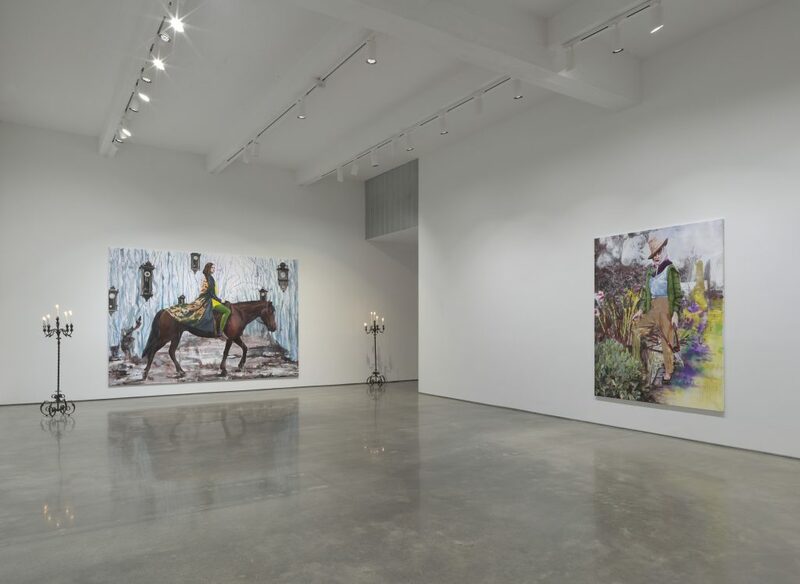 The paintings incorporate arcane references and nuanced details from sources that allude to the pastoral. 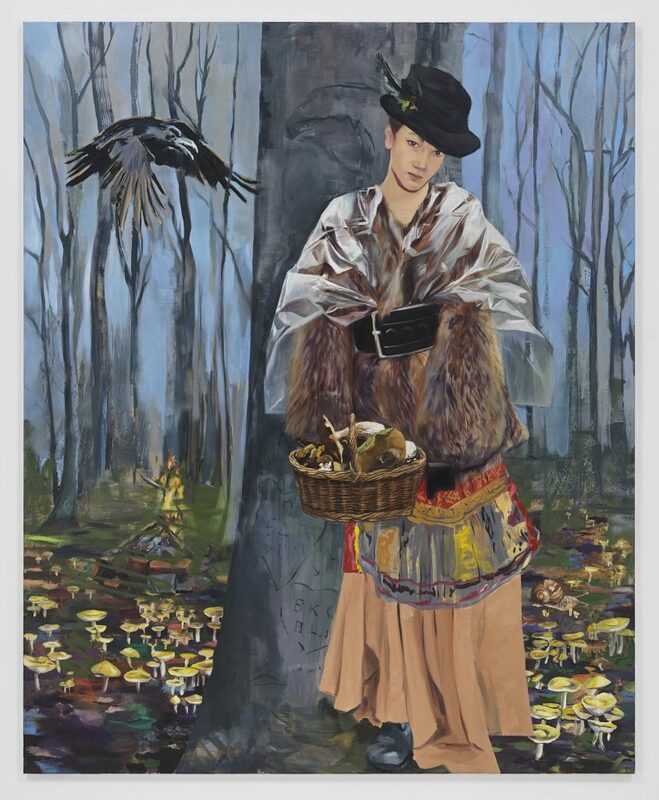 Olowska combines portraits of women from gardening magazines with elements from Slavic mythology and folklore, as well as techniques from Les Nabis, artists who left Paris in the 1890s in favor of the countryside. 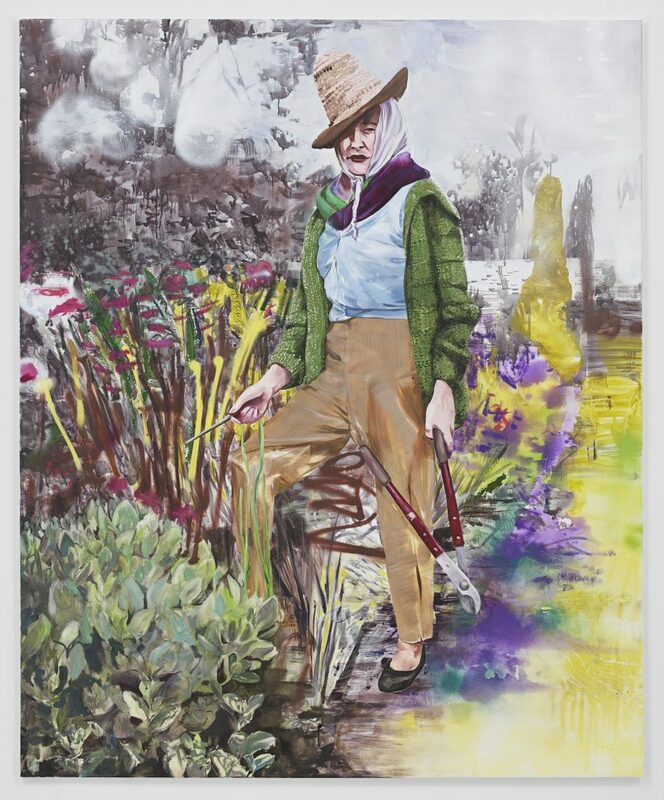 A group of paintings in the exhibition represent characters with specialized knowledge, or as Olowska describes them, her “active muses.” There are “The Mycologist,” an expert in fungi, picking mushrooms; “The Lepidopterist,” a butterfly collector who dances with an immense monarch behind her; and “The Gardener,” who stands resiliently with red hedge clippers hanging from one hand. Olowska’s atmospheric paintings evoke the forgotten history of Rabka-Zdrój’s past grandeur as a 19th century spa town. In the triptych “Wisteria,” an elegant young woman in a red dress and hat leans, arms outstretched, against a wooden fence as flowers from the tree that gives the work its title fall from above. To her right in the painting stands Villa Kadenowka, a 1930s mansion that Olowska has transformed into a center for artist events. To the woman’s left is the abandoned Modernist addition to Kadenowka. In “Hysteria,” a mother, baby in arm, stands outside a dilapidated house with a spray-painted for-sale sign. 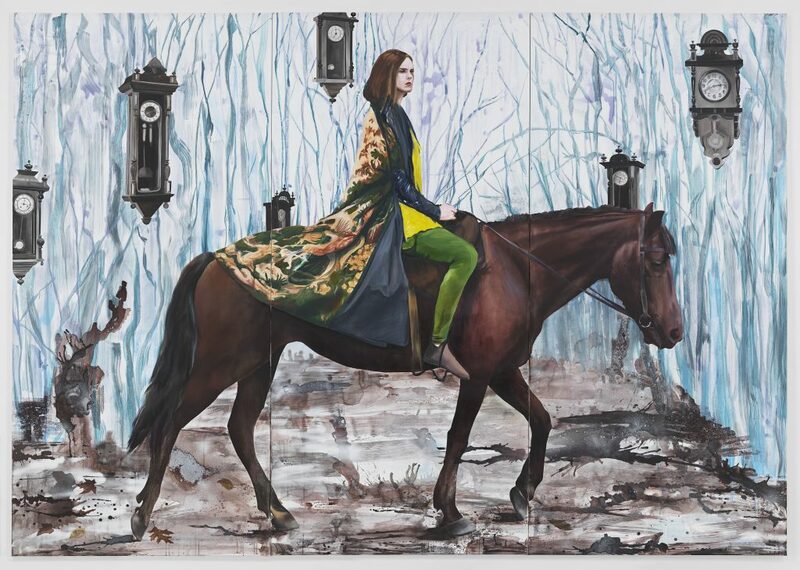 In “Mysteria,” a woman wearing an elaborate cape proudly rides on horseback through the woods. 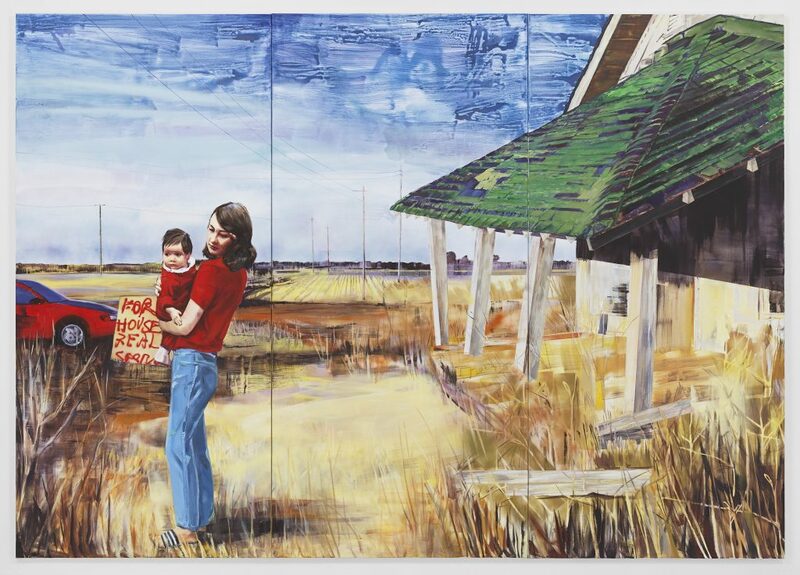 Olowska establishes a narrative between these two works; in one scene a woman chooses to leave the trappings of conventional domesticity, while in the next another embodies ideas of mobility and freedom. 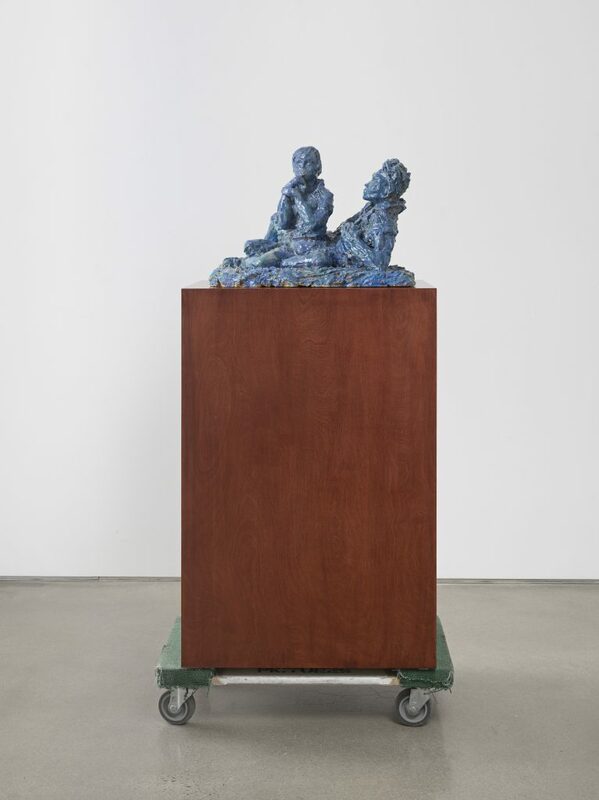 Olowska’s fascination and acute understanding of history, particularly the Modern artistic and design traditions in Poland and other former Soviet countries, has consistently influenced her work. 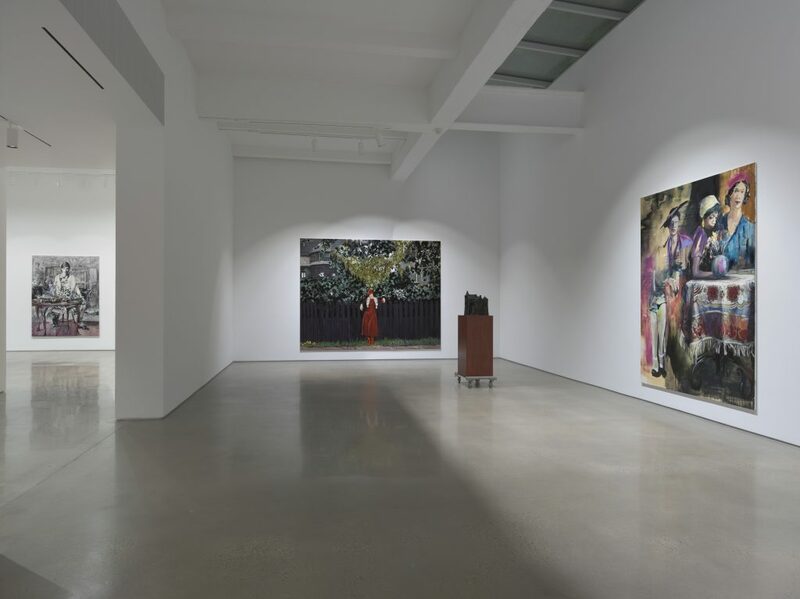 In 2015 Olowska transformed a gallery of Tate Modern for her re-staging of the play “The Mother: An Unsavoury Play in Two Acts and an Epilogue” by Stanisław Ignacy Witkiewicz. In 2012 the Museum of Modern Art hosted “Alphabet,” a performance inspired by designer Karel Teige’s typographic book “ABECEDA,” in which Olowska and other performers stretch their bodies into 26 letters, from A to Z. 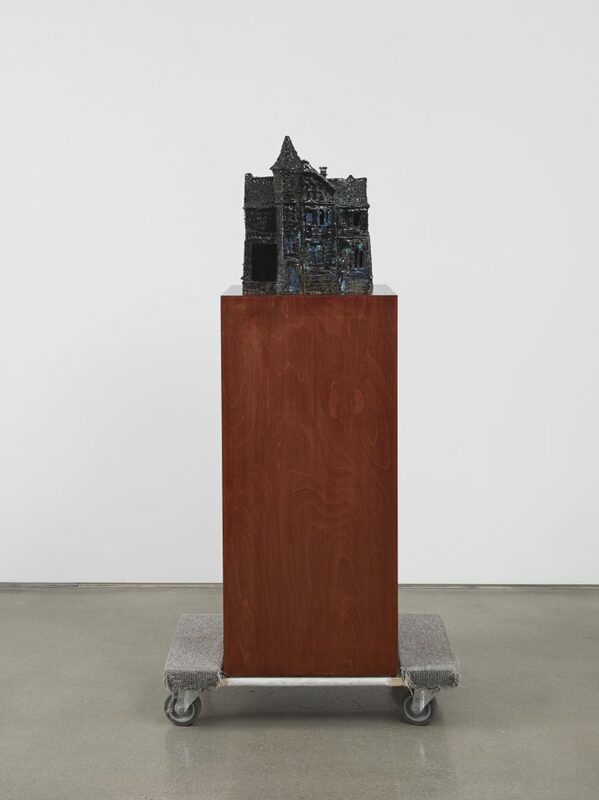 For the 2008 Berlin Biennale, she presented artist Zofia Stryjeńska’s paintings from the 1920-40’s alongside her own grayscale replicas in homage to Stryjeńska, whose works were used under communism without the artist’s consent as motifs on mass-produced objects. For her performance at The Kitchen next year, Olowska revisits Stryjeńska’s work, basing the performers’ costumes on the artist’s designs. 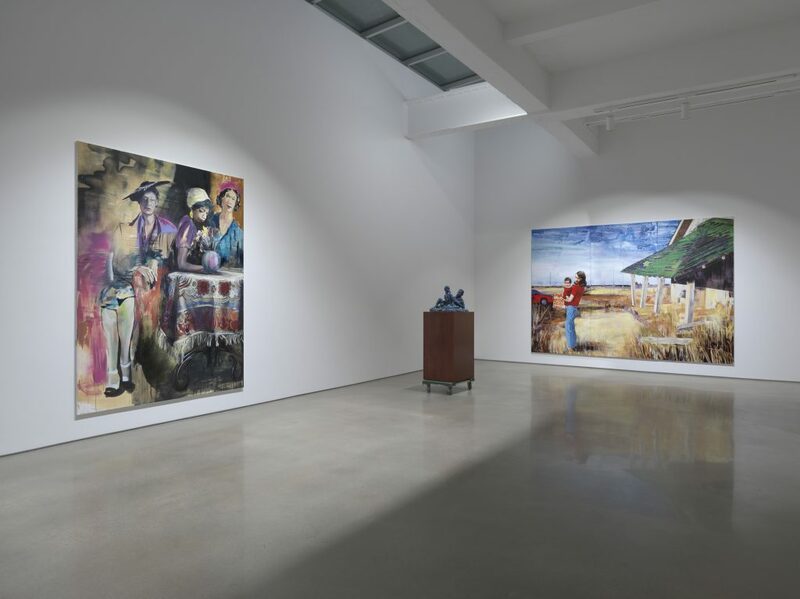 Installation view, Metro Pictures, November 4 – December 22, 2016. 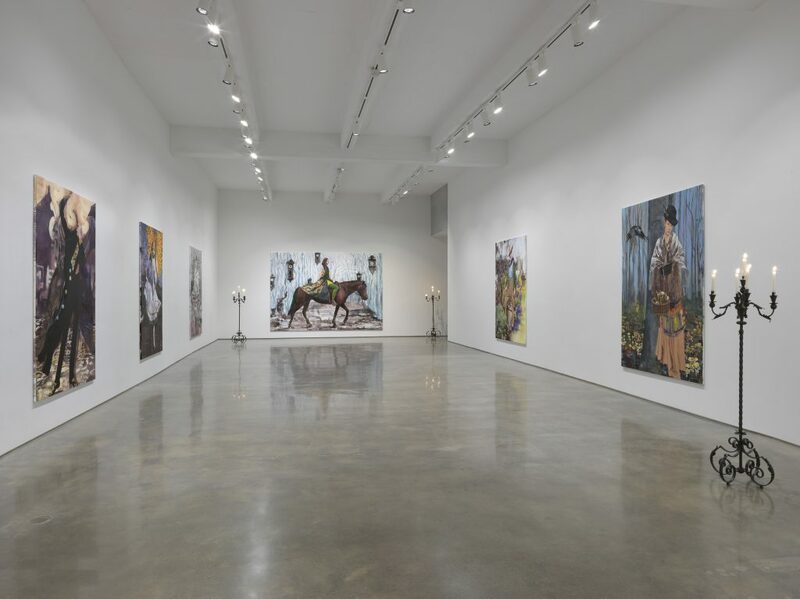 Courtesy of Metro Pictures. 102 3/8 x 146 1/2 inches (overall) 260 x 372 cm. 86 5/8 x 70 7/8 inches 220 x 180 cm. 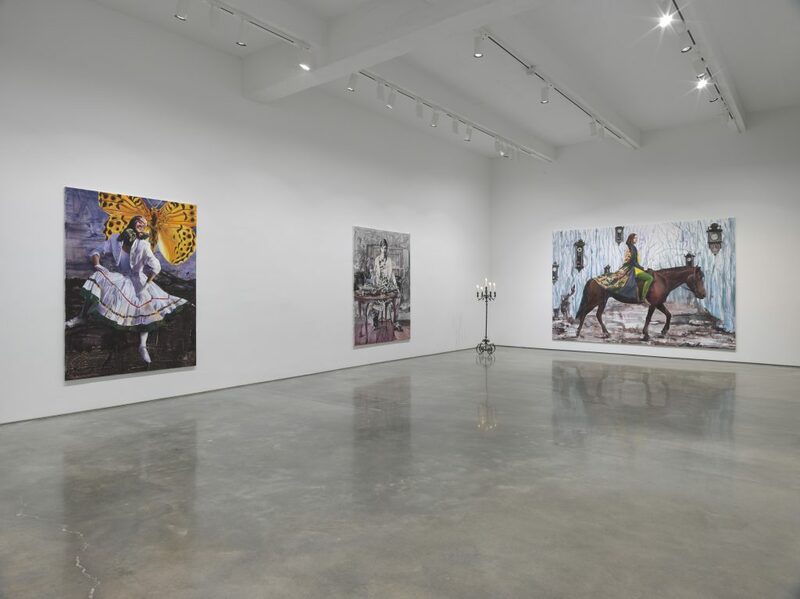 Courtesy Metro Pictures. 220 x 180 cm. Courtesy Metro Pictures. 102 3/8 x 131 1/8 inches (overall) 260 x 333 cm.